You love your kitty cat, but you might not be too enthused about cleaning her litter box. It’s a dirty job, but someone’s got to do it. And since Kitty doesn’t have opposable thumbs, guess who that somebody is? And then there’s the problem of getting rid of the used litter. You might think a cat’s bodily wastes are biodegradable, but the litter and plastic bag you’ve put it in aren’t. There must be a way to love your cat while loving the planet! The most viable solution would be flushable cat litter. Just toss it in the toilet, flush it and forget it! Why should you use Flushable cat litter? Is flushable cat litter septic safe? 5. It’s a Tea Potty! So what’s the big deal? It’s just taking out the trash, right? Not quite. Taking out the garbage is already an onerous task. Why add some nasty cat feces to an already dirty job? It would be much easier to just toss it all in the toilet and let the city sewage system take care of it like it does all the nasty stuff that gets flushed away. While many apartment blocks might have a chute that you can just dump bags of garbage in, you might not be allowed to dispose of bodily waste in this manner. And even if you live on the ground floor, rain, snow and uncomfortable temperatures might make you reconsider going out to toss a couple of bags. Don’t let your cat’s carbon paw print be marred by clay litter and plastic bags. Plastic bags and clay litter are not biodegradable. All they’ll do for years if not centuries is clutter up a landfill where they’re sure to go. After a while, those bags will just swell up and produce the most noxious of odors. Don’t contribute to the crisis of growing landfills by using clay litter. Flushable cat litter doesn’t go to landfills. As the name suggests, is flushed down toilets and disposed just the same way human waste is processed. This helps the environment exponentially. With flushable cat litter, you’re showing love not only to your cat, but all the fish and birds that live in the wild. After all, lynxes and cougars got to eat too. Unless you have the exact same pipe system the manufacturer used to test just how flushable the flushable cat litter brand you plan on using is, there is really no sure method to make an ironclad guarantee that your own toilet and pipes can handle it. What’s more, when you flush a cat litter product that expands as it absorbs moisture in cat waste, a pipe clogging is almost guaranteed. Does your home have its own septic system? That’s going to make things just a little more difficult. Even paper towels, tampons and anything cotton based can swiftly cause clogs and contamination of the entire septic system. The truth of the matter is, there does not yet exist any purely flushable cat litter septic safe product. 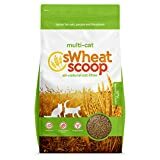 Recently, some more environmentally friendly cat litter products have appeared on the market that are composed of biodegradable materials like pine cedar, corn cobs, wheat and paper. In trivial amounts (other than paper) these substances might safely pass through a non-septic toilet and pipe system, although the possibility for clogs to happen in time after several incremental amounts is still present. 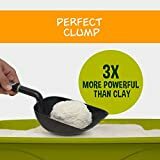 Nonetheless, many of these products may bear instructions to scoop only tiny amounts into the toilet at a time, and to wait nearly half an hour or more to let the material further mollify before flushing the cat litter away. Scientific studies have shown that Toxoplasma gondii processed through human waste treatment sites passes through unimpaired and continues to injure the surrounding ecosystem, eliminating already threatened marine life and in the end infecting people, sometimes with catastrophic results. If you flush your cat’s waste down the toilet, you may be injecting the parasite to waterways, which may at some point wash out to the sea. Once there, toxoplasmosis could result in the deaths of endangered marine mammals such as sea otters and Hawaiian monk seals. This parasite may not manifest if you have a strong immune system, but it could be only a matter of time. The second your immune system becomes compromised, you are at risk of T. gondii infection. It’s logical to assume that when the waste is processed by the municipal water treatment facility, the parasites will be terminated. Unfortunately, it is a very bad idea to underestimate T. Gondii: The parasite is incredibly durable and usually makes its way through wastewater treatment completely unchanged. State California law requires all litter manufacturers to have labels on their packages bearing a warning against flushing litter or abandoning it outdoors in gutters or storm drains. Even if you never eject parasites into waterways through flushing, they’re apt to find their way to new hosts at some point. The parasites can continue to live for years in soil and even the coldest of water. Even if kitty does her business outdoors and buries it in natural dirt, the parasites can at some point make their way to damage marine life via rainwater runoff. It may cause you great relief to know that not every cat is a host for Toxoplasma gondii. Nonetheless, this is a very common parasite and felines are the only known hosts for the beginning-stage life cycle. You may not know if your cat carries it because most cats won’t develop symptoms. Here are two methods that will reduce the chance your cat will be a T. gondii carrier. You should keep her indoors. You must not feed her meat that is raw or under-cooked. Cats that live indoors at all hours and never eat raw or under-cooked meat are more likely to be free of the parasite. Is Kitty an indoor cat? Does she never eat anything raw or undercooked? Then there is an excellent chance that she is probably not carrying T. gondii and thus will be unable to pass the parasite into her solid waste. If you are in a position where you live along the coast line and your drainage system is connected to the sewer, you should not flush the cat litter down the toilet. In the majority of situations, the waste will end up in the sea, and this will endanger the marine life and even cause the death of sea animals like fish and sea turtles. Is your home plumbing system is constantly failing? Then you should probably stop flushing cat litter down the toilet. You need to find an alternate solution. You should scoop the clumps in the litter and find other methods of disposal. Flushing the litter in the toilet could eventually block the plumbing system, and this will lead a house that smells disgusting. Some countries have laws that prohibit disposing of cat litter in the toilet. For example, in some American States, people are required to dispose of the cat litter itself since flushing it down the toilet could clog the drainage, and this might cause disastrous consequences in the time to come. There are many different types of material that cat litter can be made with, each having its own advantages and disadvantages. For example, you may like the fact that natural materials like wheat and kernel corn are environmentally sound but they may have a few problems concerning odor control and clumping cat litter. To consider all the factors, cat litters made of clay have near perfect odor control and clumping but can present a problem with an abundance of dust. The dust may concern health issues like allergies when it gets into the house. It is fortuitous that some cat litter manufacturers integrate many different types of materials to bring you the best of each ingredient. Can you really do without little that doesn’t clump? When it comes to cat litter, clumping is vital. When comparison shopping for litter, look at the reviews for clumping. It goes without saying that if a litter does not clump well, the litter box device and the area around it will be utter chaos. Weak clumping ability leads to a hard time cleaning your litter box, and you don’t want that. Related: Make sure you check our reviews of the best automated litter boxes for your cat. This is the other major trait that you must always look for in whatever cat litter you buy. It does not take a genius to see how repugnant cat waste can smell. The odor from cat feces and urine is not only disgusting but unhealthy, causing health problems in both babies and adults. Because of this, you should always purchase a kind of cat litter that can handle odors well. There are some cat litters that produce tiny airborne dust particles that can trigger an allergic reaction in you or your cat. And there’s nothing good about inhaling all that dust every day, especially for children. You may also prefer litters that have low tracking because no one wants to see pieces of litter all around the house, the bathroom, and even furniture. Bye-bye clay, hello renewable litter that performs! Here’s a litter endorsed by Garfield, America’s favorite flabby tabby with pets, pet parents and Mother Nature in mind. It’s made with all natural plant-based ingredients that are 100% biodegradable. The clumping action is very strong, though you do have to let the clumps dissolve first before flushing. There is absolutely no smell nor are artificial chemicals used. A combination of a lack of dust and small particles that do not track all make for a very clean litter. The light colored litter makes illness detection easier. Its consistency is much like cornmeal, meaning it will be very soft on tender paws. Let’s hope your cat is colorblind. Your veterinarian might appreciate the color making it easier to examine a urine sample, but your cat may find it odd. Even though it’s natural, it is made from plant, so it’s not perfectly hypoallergenic. As stated before, the clumps are just a little too solid. The litter must be allowed to soak and dissolve before flushing it. If allowed to sit for more than 12 hours, the clumps may become too hard to dissolve and must be discarded in the trash. Product is a bit on the pricey side. Could this litter possibly live up to its name? Here’s hoping. This litter is made from corn, a renewable resource that is natural and biodegradable as well as safe to flush. It traps odors and creates good, solid clumps. Cats seem to like the fine texture of the litter. The formula is 99% dust free and comes with a money back guarantee. It is recommended for houses with multiple cats. It is possible for corn to develop aflatoxin mold if not kept in a cool, dry place in a sealed bag or bin. It also tends to track quite a bit and there are some reviews claiming that the product is not as good at trapping odors as it advertises. Product is a bit on the pricey side. As it is made of corn, if you, your cat or anyone in the family has a corn allergy, you may want to give this a miss. If you’ve bought and enjoyed products from Petco before, you may be pleased with this brand of kitty litter they produce. There is no perfume smell that might irritate your cat. The tracking is very minimal as the litter stays inside the litter box. Far more efficient in absorbency than clay litter and the odor control is excellent. It is made with walnut shells so if someone in your household has an allergy to tree nuts, you might want to give this litter a miss. While it has no perfume, it does have the natural scent of walnuts that your cat may or may not tolerate. It is dusty when pouring and your cat may enjoy the feel a little too much and decide to have some fun and play with it. The clumping ability leaves something to be desired. This all natural litter can be flushed in homes with septic tanks though you really should read instructions and warnings carefully before flushing. It is made from environment-friendly renewable wheat. 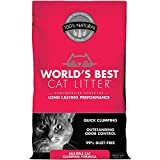 The litter claims long lasting odor control and hard clumps. There is no masking fragrance and it has little dust. It is recommended for homes with multiple cats. As a bonus, the package comes with an easy carrying handle. If you or someone in the family has a wheat allergy (often connected with hay fever) then you might not want to take your chances with this litter. The litter has a grainy texture that may not feel soft on cat paws, so some cats might refuse it. The litter can cause a bit of tracking. Let’s give points to Weruva for coming up with a clever name for this product made with all natural materials such as green tea and hinoki wood. It efficiently neutralizes even the strongest of urine smells. It easily dissolves in water, meaning flushing is a breeze. It has none of the drawbacks of clay litter. It is hypoallergenic without wheat, corn, soy or nut products. This litter is chemical-free and has no artificial fragrances, Very little dust and tracking has been reported. Is the pink Siamese cat on the label somewhat racially insensitive? Might have to ask an Asian person. 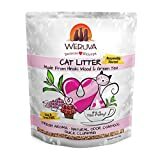 This litter is very different from others so it may take your cat a while getting used to. You might want to try gradually introducing them to it. The particles are a bit on the big side. While it has no artificial fragrance, it does have a natural woodsy aroma of green tea so it’s not suitable for cats who hate any sort of fragrance.